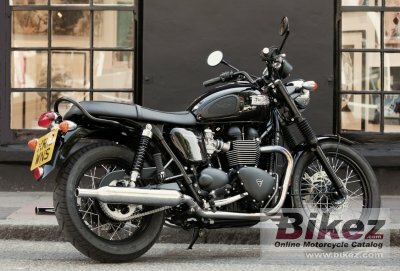 2014 Triumph Bonneville T100 Black. Picture credits - Triumph. Submit more pictures. If the easy-going style of the regular Bonneville T100 is a bit too tame for you, we�ve created the mean �n� moody Bonneville T100 Black. From its custom shop-style, black-rimmed spoke wheels past its black-cased engine with machined fin highlights to its black bars and mirrors, this is a bike that makes a statement without really trying. Price as new (MSRP): US$ 8899. Prices depend on country, taxes, accessories, etc. Ask questions Join the 14 Triumph Bonneville T100 Black discussion group or the general Triumph discussion group.